In a large mixing bowl, whip together heavy whipping cream, coconut milk and pudding mix until thickened. 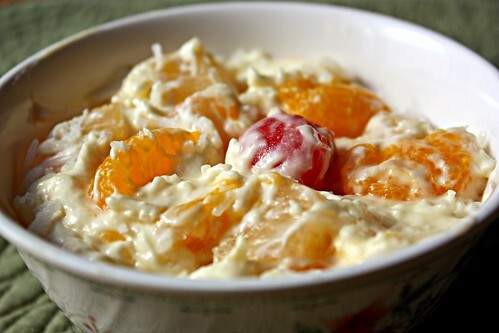 Mix in cherries, pineapple, oranges and shredded coconut. Refrigerate for at least two hours before serving. You're very funny Maggie :-) Happy Thanksgiving ! I love this kind of fruit salad! I'm sure the in-laws loved it. I'm not certain I've had it before but it looks delightful! The ambrosia was a hit at our New Years party. :) I wanted a delicious trifle filling so I made your coconut-vanilla whipped cream mixture for the trifle layers. YUM! Thanks for posting great recipes!